For many students and school staff, the end of summer marks the start of classes and a chance for a fresh start to the school year. There is a hope for academic success and an excitement in the anticipation of new friendships. To help students achieve these goals, school staff members, and parents, begin to research programs which would stimulate the development of children’s intellect as well as their interpersonal skills. At Entourage Yearbooks, a company which is leading the industry in the trend to integrate digital and printed content to create next generation yearbook media, preparations for the new school year have been made as well. The Entourage Yearbooks Web Team is pleased to announce that their new online design software, EDOnline 6.0, will be released at the end of August 2015. Drawing inspiration from suggestions made by customers during the user experience survey has made EDO 6.0 a big hit! The web development team has added features which enable increased control and assurance in the precision of designs. According to Nicole Lipnitz, web development team leader, one of the most exciting updates is the simplification of the photo placement process. She has made this possible through the creation of a “Click-to-Click” option. 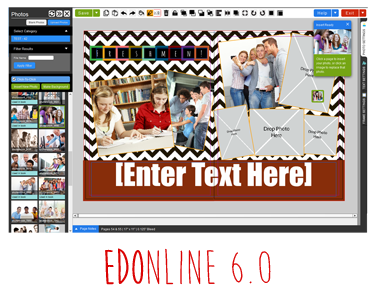 Yearbook designers can now simply click on a photo to select and click on a photo frame to place. Unique backgrounds, using personal photos, are also just a click away with the “background” button. Of course, there are still hundreds of new pre-made backgrounds and graphics which are available to users of EDOnline 6.0. However, the background button provides designers the assurance that their personalized photo-background will fit the page perfectly. Another innovative addition is the clipping tool. This would allow designers to select an element in a photo. Then, they can remove the background around the selected element. According to Kristen Kelly, of the web development team, the clipping tool requires just a couple clicks and is really easy to use. What are Advisors Saying About EDO 6.0? Yearbook Advisors will also find that the new version of Entourage’s design software has a layout which is sleek and more user-friendly. Users of EDOnline 6.0 will first notice that only one designer is needed to create covers, pages, and end-sheets. Templates, photos, and graphics can now be accessed from the side scroll-bar. Now the entire design space can be seen while selecting elements for placement. Even the text tools are easier to find and use. After choosing text options in the scroll-bar, users will have the ability to spell-check as well! From there, text can be added to wrap around, or inside of, various shapes and be formatted further. Although many of the updates have been mentioned, there are many more features available! Contact Entourage Yearbooks to learn more about how they can help make your design a reality. Visit http://www.entourageyearbooks.com/RequestInformation.asp to request a free yearbook sample and a yearbook price proposal. Entourage works with high schools, middle schools, elementary schools and colleges/universities. Their work also spreads to military groups and churches around the country to fulfill their yearbook publishing needs. They proudly offer the fastest turnaround time in the industry, and affordable prices. In most cases, Entourage Yearbooks are priced 20% below other companies.